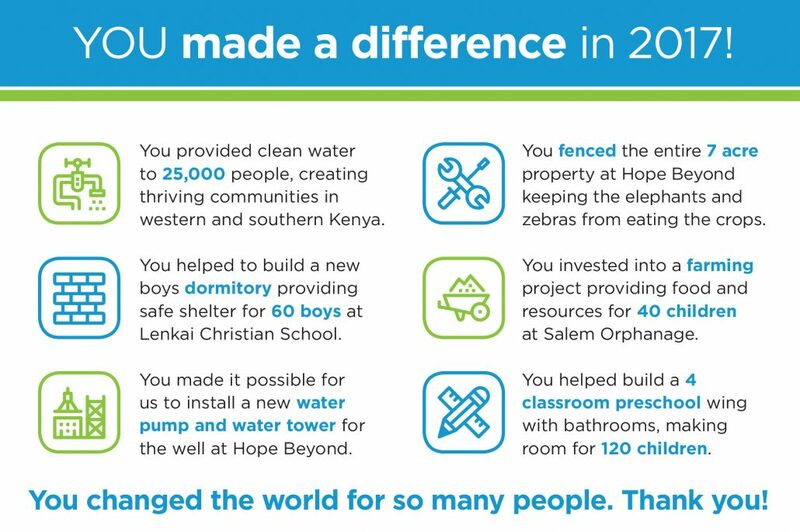 This past year was an incredible year of growth and impact for Just One Africa and our partners in Kenya. Thousands of lives were changed and impacted because YOU chose to say YES and gave to Just One Africa’s Sustainability and Clean Water Programs. Each of those lives you impacted is important, valuable, and full of so much potential. In 2017, you helped provide safe, clean water for over 25,000 men, women, and children – wow! We can’t emphasize how incredible and life-changing that is for families, children homes, medical clinics, and community centers. Your giving provided a brand-new dormitory for 60 at-risk boys in Lenkai Christian School; a place to for them to live and grow as they receive their education. 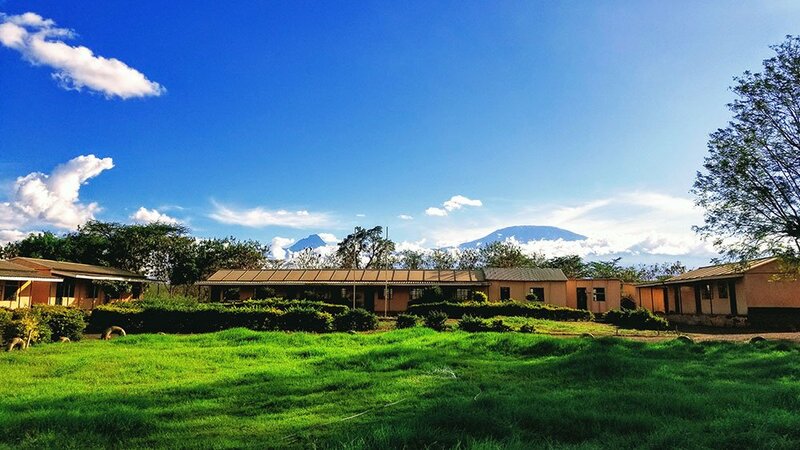 You made it possible for us to install a water pump, tower, and tanks at Hope Beyond Transitional Center as well as build a high-quality electric fence around the whole property to keep goats, zebras, and elephants out. Yes, you read that right, elephants. They will have to find their bananas somewhere else now! This will allow our partners to increase their ability to water more crops, grow more food, as well as protect it from animals, thereby securing the resources needed to care for the kids at the center. Your support meant we could come alongside another partner in Western Kenya on a capacity-building agricultural project providing food and resources for 40 children at an orphanage. This was seriously a blessing and much needed! Another awesome project this past year was the construction of a brand new preschool wing which will educate 120 children. The preschool also included flushing toilets (a big deal!) for our partners in southern Kenya! This allowed them to increase the student population to over 200 students, bringing in even more resources to keep improving their educational programs and employing quality teachers. Education is KEY to changing the poverty cycle and it has been one of our greatest joys to watch this excellent school, amazing staff, and eager students excel higher and higher in character and knowledge. While the numbers can be impressive, our heart is all about the ONE life. Our programs provide meaningful opportunities to interact, listen and learn; allowing us to better serve the communities we work with. Your giving means that the life of a child, parent, community worker, child advocate, or local leader is now encouraged, empowered, and equipped with life-changing knowledge; filling their hearts with hope and providing life-saving tools. We know that 2018 is going to be another year full of growth and opportunity for Just One Africa and we will need your support more than ever! From the bottom of our hearts, we say THANK YOU!